Modern fit. Order One Size Bigger for Regular Fit. Men's fashion blazers are designed for the man who loves to be in the spot light. These maximum visibility fashion blazers have unique patterns and designs that made for the night life. 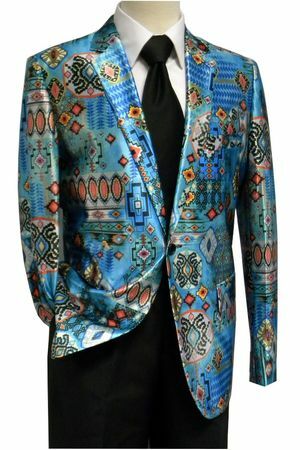 This Turquoise satin fashion blazer features an Aztec pattern that you have never seen on a blazer before. Featuring a Modern fit and side vents that will certainly get you on the "A" list.